GitHub - gamer-cndg/omega2-wii-classic-controller: A library with which one can use a Wii classic controller with the Omega2. A library with which one can use a Wii classic controller with the Omega2. Want to be notified of new releases in gamer-cndg/omega2-wii-classic-controller? 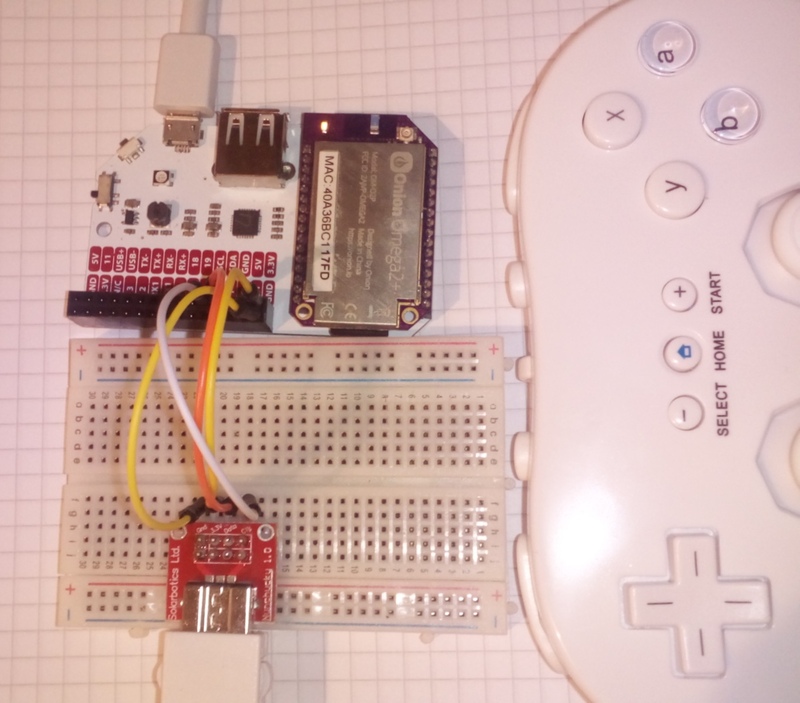 This library enables the Omega2(+) to communicate with a WiiClassic controller via I2C. From the adapter board, connect GND to Omega's GND, VCC to 3.3V, Data to SDA and Clock to SCL. Do not insert the adapter the wrong way up, or else GND and 3.3V will be exchanged and your controller will be damaged through reverse polarity. First, you need to initialize the controller by calling WiiClassic_Init(). The functions returns a bool which indicates the presence of the controller. For reading data, allocate a wiiclassic_status_t object and give a pointer to it to WiiClassic_ReadStatus(). Optionally printing the controler values by calling WiiClassic_PrintStatus() or access the members of the wiiclassic_status_t object directly. For an example, see the main.c in this repository. This project was designed for cross-compliation. Compile your toolchain according to https://docs.onion.io/omega2-docs/cross-compiling.html, change the paths in the Makefile (TOOLCHAIN_ROOT_DIR) and do a make all. Optionally, make upload will attempt to use sshpass with scp to transfer the compiled binary to your Omega Onion2 system. Simply change the IP address and the password if you whish to use this feature. For resons of simplicity, the header and library files for the I2C functionality has been included in this project. You can also compile the project by yourself (https://github.com/OnionIoT/i2c-exp-driver/). See the Makefile of this project to see how a userspace program may be compiled and linked against this library. Install the I2C library by typing opkg update && opkg install libonion2c If you already have that library, skip this step. Transfer the libwiiclassic.so file from this repository to the /usr/lib/ folder on your Omega2, e.g. by using ssh or scp. Transfer the main file (ELF) to some directory on your Omega2, e.g. /root/ and run it! This library has only been tested with an original Nintendo Wii classic controller. Clones might or might not work.